Prior to departure, I have been warned. 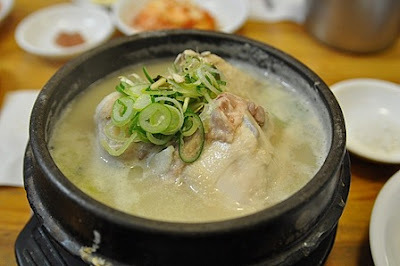 There is this most amazing Samgyetang or the Chicken Ginseng Soup dish (see image) that is totally awesome- and is a must try. Have noted this down, and did my research on a few places within our hotel that's famous for it. But they say- don't bother with all other dishes, they're all either too spicy or too sweet! Some truth, yes, but not entirely. To describe our adventure as "one hell of a food trip" might be more accurate. My Korea = YUm. Yum. yum. mmmmmmmmmm. I honestly don't know what these are. I've tried asking- to no avail. I think they're sweet and crunchy. Wasn't very gutsy to try them either. oh these yummy things. The round ones are filled with a sweet sugary, honey-like filling, which i must say is very addicting, especially when you eat them warm. mmmmm. My sister couldn't get enough of these, she had like 2. The long one in the middle is filled with noddles- resembling chap chae, while the other one has the texture of a squid ball/ fish ball. These are chestnuts! They're not cheap, but they're good. Roasted right in the middle of the street. Some yummy sausages. They're skewered several pieces to a stick of 3 kinds of sausages, one even with a squiddy filling inside. Put your own mustard. Verdict: real good. These are like fish cakes. And there's even a variety with hotdogs inside. Some of those dough things with korean japchae-like noodles inside. These too are good. These are super tender chicken meat on sticks- with different sauce options of Barbeque, Sweet or Spicy. They're awesome, and the leeks blend so well with the flavor. Missing this already. Obviously- this gets an over the roof rating from us. These waffles are filled with either vanilla or chocolate filling. They're nothing like the Belgian type waffles (and I do mean it in a good way). It has it's own magic. The pastry itself is light and slightly crusty not the heavy buttery type you might be expecting. Definitely worth a try! This isn't streetfood. It's boneless chicken jjimdak. It has sticky rice noodles beneath and a very generous serving of chicken. We ordered 1 to share among 3 hungry shoppers, and we still had about half remaining. The spiciness might be partly to blame. And yes. it is SPICY- where you can see whole slices of chili scattered when served. Give it a try. We had this is in a 30-year institution in myeongdong. What's Korea without Kimchi? It's served with almost all dishes, unlimited servings too. Their dumplings- which actually look and taste more Chinese than Korean pair perfectly with the Ramen. (They do have a very rich history involving the Chinese folks.) I love dumplings in all its forms, and proud to say I can distinguish their citizenship by now. Chinese dumplings would be neutral ground for me. Korean dumplings are usually bigger, and have some form of noodle inside and sometimes even other veggies like carrots; (while the Japanese kind tend to be a bit more tough (not in a bad way) and usually saltier.) These ones I would say are trying hard to be Korean but they're really Chinese if you check their passports. Korean Chicken Barbeque Galbi Stir-fry. Also not a streetfood but a good cheap eat nonetheless. They cook this in your table- and you can get unlimited servings of kimchi and other appetizers too. Pajeon: Korean onion pancakes cooked in the middle of the streets. Must try! And so I ask- why does their street food seem so clean? And even the streets- where the streetfood are. You would expect the sauce drippings to be all over and spilled oil and not to mention the actual garbage from these? Well, these streets- and the food- ARE REALLY SUPER CLEAN. My tummy's one too sensitive about these things. The answer to my question is- you don't see them in the morning. They appear only like after 4pm or so. Meaning, they clean to invisibility- and don't leave anything, not even the empty tables behind- on a daily basis. Whew- that must exhausting. Mommy and I- that Ice Cream's already more than halfway through! My personal favorite: The soft-serve ice cream in myeongdong. They're W2,000 a pc = P80, and it's 32cm in height- which is close to a foot long if i'm not mistaken, and comes in a variety of flavors including vanilla-chocolate, strawberry-chocolate, green tea-vanilla, yogurt- strawberry. I buy this on a daily basis. Korea's most famous Ttboekki. They even have a whole alley dedicated to these things. What NOT to have: Dukbokki/ Tpokki/Ttboekki. Oh my. It's their most popular streetfood, enjoyed by locals young and old and even office people in suits and heels. But seriously??? Don't be fooled. And it's nothing close to pasta. They're made of sticky rice, and the sauce is just plain spicy. not tasty spicy, or yummy spicy, just spicy. Don't dare. Waste your calorie allotment on something else. We ordered a small dish to share and had just 1 piece each- and I can honestly feel the locals staring when we left almost the entire thing uneaten. (and we're not types to waste food). Budget: Hmm... Each item cost somewhere between W1,000 (P40/ $1) to W3,000 (P120/$3). It's generally more expensive when you're outside the city- in touristy places like Nami Island or Lotte World, but prices are the same when inside Seoul. When having it for a meal W6,000 (P240/$6) would more or less be ample. Other places to catch these treats: Myeongdong! Last Foodie Highlight: Watch Nanta! This funny kitchen show is one of a kind. It's a musical with only pots and pans as musical instruments. Don't speak Korean? No worries! It's non-verbal. And they've recently been to Broadway! There are 3 Nanta theatres in Seoul with 3 shows per day (Myeongdong branch) and 2 each for the rest. Check out special discounts online. It really is super fun and it's hard to leave without a smile on your face. For those planning to visit- please don't hesitate asking questions by dropping a comment. For those who have been- please share your thoughts! going there tomorrow!! im so excited :D thanks for sharing this!